ON PROVINCIAL MAP BELOW: BLUE = swimming hole, GREEN = road trip dip (click here for info) , RED = hot spring. Hold cursor over map tags for info, then click to go to detailed listing. The map location is very approximate. Use our directions with a highway map. Commercially operated hot springs (naturally hot water, 108 degrees F) has many pools plus a horseshoe-shaped hot springs cave with waist-deep water to create a natural steam bath in caverns filled with stalactites. Beautiful surroundings. Hotel and resort also. Yes, about $12 (in 2014) for day use of pools. From Spokane (WA) drive about three hours north on RT 395 , (RT 3 and RT 3A after you get into Canada) to Nelson, British Columbia. From there, follow the west bank of Kootenay Lake (RT 3A and RT 31, through Balfour) for another 45 minutes to the Ainsworth Hot Springs Resort. If you get to Kaslo, you have passed it. . Swimming holes at the foot of a beautiful, high waterfall in Cascade Falls Regional Park. Maybe several below smaller falls downstream also. The park WEB SITE recognizes that there is swimming there but cautions that there are NO lifeguards and there can be strong currents. From Vancouver, take RT 1 south to Exit 44 at Coquitlam. Take Lougheed Highway (RT 7) east past Maple Ridge and Mission to Hatzic. Just past Hatzic, turn left onto Sylvester Road. Follow Sylvester Road for 14 km then turn right on Ridgeview Road. Cascasde Falls Regional Park is located at the end of Ridgeview Road. Informal swimming place in river in Provincial Park. LINK TO WEB SITE & PHOTOS. From the web site: "There is no designated swimming area at this park, although a number of calm swimming holes and deep pools provide good opportunities for swimming. There are no lifeguards on duty at provincial parks." No camping at this park. From Victoria, take Douglas St/Trans-Canada Hwy/BC-1 North for about 60 km. Turn left onto Trunk Rd and go 0.5 km. Continue onto Government St and go 1.6 km. At the roundabout, take the 1st exit onto Cowichan Lake Rd and go 1.5 km. At the roundabout, take the 3rd exit and stay on Cowichan Lake Rd for 2.0 km. Continue onto Tansor Rd for 0.8 km then turn left onto Cowichan Valley Hwy/BC-18 W and go 2.6 km. Turn right onto Hilcrest Rd and go 6 km into the park. Swimming places are in the river, no better directions. Many swimming places near the town of Creston in far southeastern BC, including the Kootenay Lake area. For details, see DIRECTIONS below. North and East of Creston are several Provincial Parks with camping. GOAT RIVER BOTTOM [GOAT]: Popular local place for cooling off and socializing in the Goat River just south of Creston. Check the depth and check for underwater obstacles before swimming. To get here from Creston, go south on RT 21 to the first bridge. Park near this bridge and go down to the Goat River below. LAT, LON: lat=49.08213, lon=-116.52246 (source: map) (accuracy: approximate) LINK TO GOOGLE MAP MAP. Not verified. Pretty confident. Updated 3/2013. CORN CREEK [CORN]: Short walk in West Creston to a swimming place in the creek with a tire swing. To get here from Creston, take Crowsnest Hwy/RT 3 west (follow signs for Salmo) for about 10 miles (across the Kootenay River). Then turn left onto West Creston Rd (keep left to stay on this road) and go about 4 miles to the bridge over Corn Creek. Park near this bridge and look for a trail going upstream along the creek. Walk this trail for about .5 mile to a pool with a tire swing. LAT, LON: lat=. 49.08962, lon=-116.62215 (source: map) (accuracy: approximate) LINK TO GOOGLE MAP MAP. Not verified. Pretty confident. Updated 3/2013. The below places are all north of Creston on RT 3A along the east shore of Kootenay Lake. For general info on this route, see ALONG RT 3A. SIRDAR WATERFALL [SIRD]: Going north on RT 3A from Creston along the east side of Duck Lake, park near the Sirdar Pub. Walk north along the road until you hear a waterfall on the north side of the road. LAT, LON: lat=49.25436, lon=-116.63240 (source: map) (accuracy: approximate) LINK TO GOOGLE MAP MAP. Not verified. Pretty confident. Updated 3/2013. KUSKANOOK BEACHES [KUSK]: Continue north on RT 3A along the east side of Kootenay Lake to Kuskanook. Park on the road near town and walk to the beaches on the lake. No better directions. LAT, LON: lat=49.30184, lon=-116.6567 (source: map) (accuracy: approximate) LINK TO GOOGLE MAP MAP. Not verified. Pretty confident. Updated 3/2013. TWIN BAYS [TWIB]: Nice public beach area on Kootenay Lake with not too cold water. Has restrooms. Continue north on RT 3A along the east side of Kootenay Lake to Twin Bays Rd. on the left. The beach is at the end of this short road. LAT, LON: lat=49.34143, lon=-116.7209 (source: map) (accuracy: approximate) LINK TO GOOGLE MAP MAP. Not verified. Pretty confident. Updated 3/2013. A HUGE rock beside the Trans-Canada Hwy overlooks a cold-water creek that comes to a pooling place. If you climb up on the rock you can jump right in from the rock if you are brave. There is also a path down to the water - very cold and refreshing - crystal clear. From Revelstoke, go west on RT 1 (Trans-Canada Hwy) about 25 minutes and, about 3 minutes west of the Enchanted Forest roadside attraction, see on the north (right) side of the road a HUGE rock. There is room for about 2 cars to park by this rock. The swimming hole is behind this rock. Remote, natural hot springs in southeastern BC. Two pools, add river water to cool off, plywood soaking box. Remote but spectacular (and popular) hot springs on the southwestern coast of Vancouver Island. Requires boat or floatplane to access - commercial transport services are available locally. Three pools, ocean rushes into some, whale watching also! There is a wooden boardwalk and a campsite. Bring camping gear and stay a few days. No supplies at site. There is a well-maintained campsite. From Victoria (on Vancouver Island) take RT 1 north through Duncan and Nanaimo then go north on RT 4 to Tofino (total 150 miles). Hire a water taxi (about $75 round trip) or floatplane (more expensive) locally to go to Hot Springs Cove. Many swimming holes along the Koksilah River in the Provincial Park and nearby. Two of the best are Marble Falls and at Burnt Bridge. The park WEB SITE recognizes that there is swimming there in the river but cautions that there are NO lifeguards. Koksilah River Campground has been closed indefinitely. Bamberton campground is located 22 km south on the Trans-Canada Highway. From Victoria, take RT 1 (Trans-Canada Hwy) north many miles to Mill Bay. Turn west off RT 1 at Shawnigan/Mill Bay Road in Mill Bay. Follow the road about 3.25 miles to Shawnigan Lake, then turn right onto Shawnigan Lake Road then, in a short distance, turn left onto Renfrew Road (a logging road) and follow it about 6 miles to Koksilah River Provincial Park. LIARD RIVER HOT SPRINGS P. P.
From Dawson Creek, in northeastern BC, take the Alaska Highway northwest about 760 kilometers to Liard River. Lynn Canyon Park, in North Vancouver, is an urban park with a great swimming hole, "30 Foot Pool" and maybe some others. It is accessible by both car AND mass transit! Ain't Vancouver wonderful! MORE INFO . By Car: From Vancouver take RT 1 (Trans-Canada) to the Lynn Valley Road exit. Turn north (right) onto Lynn Valley Road. From Lynn Valley Road turn right onto Peters Road. The Lynn Canyon Park entrance is at the end of Peters Road. By Public Transit: From Vancouver, take the Sea Bus to Lonsdale Quay. From the Lonsdale Quay bus loop take the #228 or the #229 bus. The #228 stops along Lynn Valley Road. The #229 stops at the corner of Peters Road and Duval Road, a 2 minute walk from the park entrance. Alternatively, if you are coming over the Second Narrows Bridge from Vancouver, take the #229 bus from the Phibbs Exchange bus loop in North Vancouver. "30 Foot Pool" is an easy 15 minute walk from the parking lot. Cross the suspension bridge, walk north along fairly level terrain until you reach the bottom of a staircase. 30 Foot Pool is on the left. From Vancouver, take RT 7 east to Hope then RT 3 east to Manning Provincial Park. Find the Manning Park Lodge, then go about 2 miles east of there and turn right when you get to trailhead signed Mon 78-83. Park and hike the trail near the gate and you will shortly come to an old bridge on the left of which is the swimming hole. 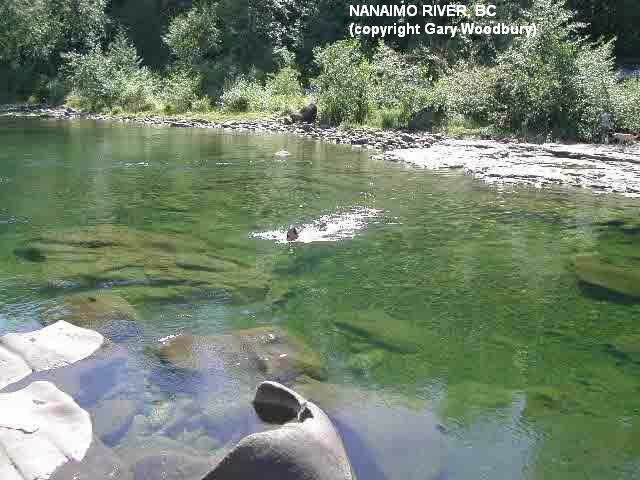 Several swimming places near the town of Nanaimo on Vancouver Island. For details, see DIRECTIONS below. At Englishman River P. P.
NANAIMO RIVER [NANI]: Just north of Cassiday on RT 1, Nanaimo River Rd. goes west (left turn) past a bungee jumping place and then along the Nanaimo River. The river is relatively warm and there are many swimming places in the river along here - camping places also. DO NOT SWIM AT "WHITE RAPIDS" OR AT OTHER LOCATIONS WITH SIGNS WARNING OF DANGEROUS CURRENTS. THER HAVE BEEN DROWNINGS HERE. PHOTO. LINK TO INFO , MORE INFO . Where you see cars parked, park and walk down to the river. Bathing suits are optional at some of the more private locations. Try this more private place: On Nanaimo River Rd., park about .6 miles west of the intersection with Nanaimo Lakes Rd. and walk a short distance on a trail to the river. Go downstream a short way to a rock near a bridge. LAT, LON 83/W84]: lat=49.08, lon=-124.0(source: DeLorme) (accuracy: general area) LINK TO GOOGLE MAP MAP. Not verified. Pretty confident. Updated 3/29/05. TOP BRIDGE [TOPB]: Popular swimming place with rocks to jump from in the Englishman River. YOUTUBE . You can approach from either side of the Englishman River. Both approaches are off of RT 19 east of Parksville (Parksville is west of Nanaimo). (Directions off RT 19 are convoluted, use a map or put the coordinates below in your GPS to get here.) To approach from the east side (looks like the easiest), take Cattell Rd to the river at 49.29821,-124.2646. To approach from the west side, take Allsbrook Rd. to the river 49.29835,-124.27219. LAT, LON :lat=49.29821 lon=-124.2646(source: map) (accuracy: approximate) LINK TO GOOGLE MAP MAP. Not verified. Pretty confident. Updated 3/2013. ENGLISHMAN RIVER FALLS P. P. [ENGL]: Many swimming places in the (colder) Englishman River. LINK TO INFO . Camping also. Bathing suits may be optional in some of the more remote spots. To get here, from RT 19 (Vancouver Island Highway) near Parksville, turn west (left) on RT 4 then in a short distance turn south (left) on Errington Rd. toward Port Alberni. Follow signs to the Englishman River Falls Provincial Park. Drive to the picnic area, and over a bridge near Englishman River Falls. Turn right and see signs to the trail. Hike the trail along the river and the swimming places are along here. For more privacy, hike further. LAT, LON :lat=49.25005, lon=-124.35639(source: map) (accuracy: approximate) LINK TO GOOGLE MAP MAP. Not verified. Pretty confident. Updated 3/2013. Quoted from the above web site: "From Victoria, take RT 1 (Trans-Canada Hwy) north about 6 miles then exit at Helmcken Road (near Victoria General Hospital) and turn left immediately on Watkiss Way. Follow the road straight through the four-way stop until it makes a sharp right turn and becomes Highland Road. Drive slowly past the new subdivision and into Thetis Lake Park." "Prior Lake is on the left about one kilometer down this very scenic, winding roadway. Please use ample caution and watch out for pedestrians and cyclists when driving this narrow road, as it has several corners with minimal visibility. There is no signage identifying the lake, but there is a small gravel parking lot at a bend in the road just before a short bridge crosses Craigflower Creek that flows out of the lake." "Please do not park with any portion of your vehicle on the pavement, or directly in front of the gate at the trailhead, or you will be quickly towed. There must be ample room for emergency vehicle access along the road and to the lake at all times. Also, please stay on marked trails to help preserve the natural habitat and, most importantly, obey the signs and avoid the rocky outcropping above the dock, as voyeurs are strongly discouraged. There is a short, easy pathway down to the lake, although it is not suitable for wheelchair users unless there is someone to provide assistance." Scotch Creek is a small summer tourist town on the shore of Shuswap Lake. Scotch Creek itself flows into Shuswap Lake just west of town. The swimming hole is somewhere in this creek. Not sure of directions. If you find it, please tell us. At Scotch Creek P. P. on the east side of town. From Vancouver take RT 1 then RT 5 northeast many miles to Kamloops. From Kamloops, take BC-1 E/Trans-Canada Highway/BC-97 toward Banff/Vernon and go 25 km. then continue onto Trans-Canada Hwy for 40 km (through Chase). Turn right onto Squilax-Anglemont Rd (signs for Scotch Creek/Anglemont/Adams Lake) and go 17 km then turn left to stay on Squilax-Anglemont Rd into Scotch Creek. The swimming hole is somewhere in this creek. Not sure of directions. If you find it, please tell us. Also known as "St. Agnes Well". Highly-ranked hot spring, near Vancouver, has a large soaking tub with valves to adjust water temperature and cold shower nearby. On private land but maintained by BC Forest Service. Primitive camping on site. Eroded potholes in riverbed. A popular swimming place but with lots of room and potholes for all. Walk past a gate that is posted "private properly" (apparently an OK practice) to find additional potholes. There�s more to the Sooke Potholes than just swimming. A small creek runs under a wooden bridge on the way from the parking lot. Further upstream along the creek, there is a modest, but photo worthy spot, complete with a waterfall, mossy rocks and shallow pools of clear water. Since most people will be heading for the beach, there�s a chance that you will have this waterfall to yourself for a while. Also, if you hike a couple of miles on the Galloping Goose Trail (which is parallel to the road) you can get to more private pools where skinny dipping may be possible. LINK TO WEB SITE , ANOTHER WEB SITE. There is developed, public camping at The Land Conservancy Sooke Potholes campground just north of here. From Victoria (on Vancouver Island) take RT 14 (West Coast Highway ) west to Sooke then turn north (right) on Sooke River Road and go about 5 km to the Sooke Potholes Provincial Park. There are a number of designated beaches north of here along this road. On the island of Texada (take auto/passenger ferry) is an abandoned quarry used for sunning and swimming. The island has two stores, a library, Credit Union, gas station, elementary school, hotel, bed and breakfasts, The Ravenous Raven Restaurant, two museums, two firehalls. There are parks, forests, lakes, beaches and mountains. Parks include South Texada Island Provincial Park and Shelter Point Park (has developed camping). Shelter Point Park, near Gillies Bay on west side of island, has developed camping. Also developed camping at Saltery Bay P. P. south of Powell River on RT 101. There's also Willingdon Beach Campground, which is right in Powell River, so it's close to amenities, and only a few minutes from the ferry to Texada. Very convenient. But you definitely need to book well ahead in the summer! Look on a map for the town of Powell River, west of Vancouver on the Strait of Georgia. From Vancouver, you have to take a couple of ferries to get to Powell River then another ferry to get to Blubber Bay on Texada Island. From Blubber Bay, go about 3 miles south on Blubber Bay Rd. to the quarry. (This one is actually in Alberta, but it is just across the line so we include it with BC). With crystal-clear water and 3 swimming holes (one in each tier) Three Tier Falls is an outstanding swimming location. From Calgary (in western Alberta, near Banff) go south on RT 22 to Turner Valley. In Turner Valley, take RT 546 west into Kananaskis Country and Sheep River Provincial Park. Continue on scenic road to the end and park in the lot. Walk upstream along the Sheep River to a crossing place near the tumbling dam. BE CAREFUL IN CROSSING IF THE CURRENTS ARE STRONG. Find the "Main Valley Trail" trail and hike about 4.5 miles southward along Junction Creek (passing several waterfalls along the way) to Three Tier Falls, where the swimming places are.